1. Van Sonderen A, Thijs RD, Coenders EC, et al. Anti-LGI1 encephalitis: clinical syndrome and long-term follow-up. Neurology. 2016;87:1449-1456. 2. Irani SR, Stagg CJ, Schott JM, et al. Faciobrachial dystonic seizures: the influence of immunotherapy on seizure control and prevention of cognitive impairment in a broadening phenotype. Brain. 2013;136:3151-3162. 3. Bien CB, Holtkamp M. “Autoimmune epilepsy”: encephalitis with autoantibodies for epileptologists. Epilepsy Currents. 2017;17:134-141. 4. Ariño H, Armanqué T, Petit-Pedrol M, et al. Anti-LGI1-associated cognitive impairment. Neurology. 2016;87:759-765. Data from three randomized clinical trials offer promising results for the use of patent foramen ovale closure in the treatment of cryptogenic stroke. 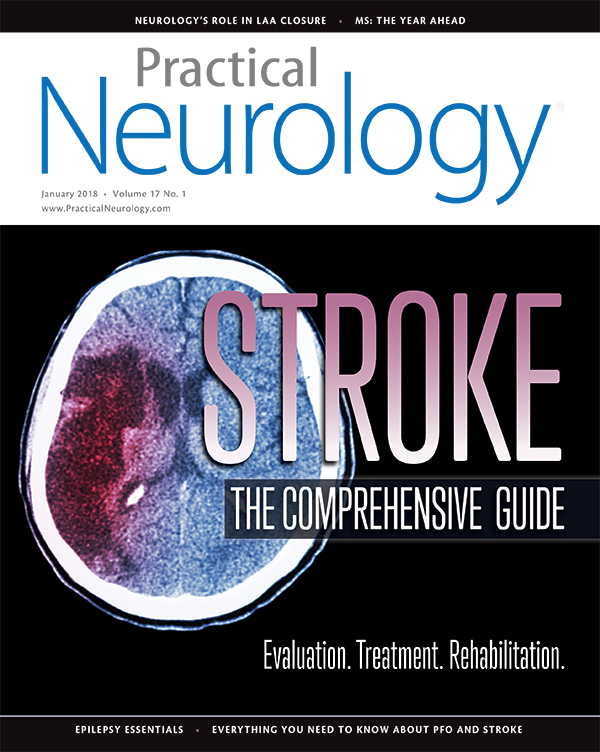 A guide to simplify stroke patient dispositions.